How many hand embroidery stitches do you know? Learning all the different hand embroidery stitches is not as difficult as you think. 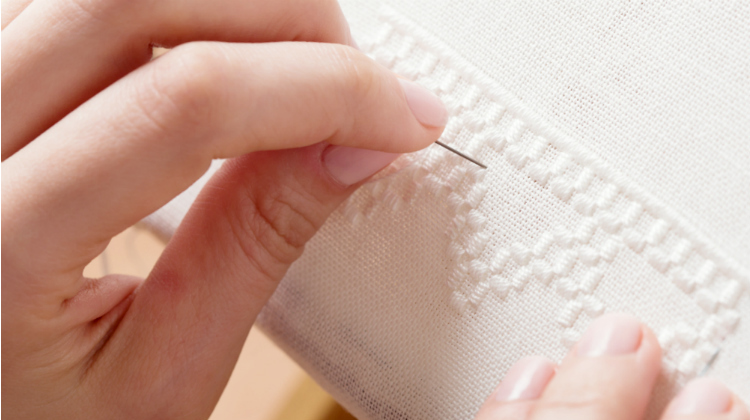 With patience and practice, you’ll get the hang of this special sewing skill in no time! Embroidery is a handicraft that uses yarn and needle to create a beautiful design pattern. You can certainly create and have fun at the same time by simply creating your own embroidery pattern. But before you can make different hand embroidery designs, you need to learn the types of stitches for embroidery we’re about to share! Learning all the embroidery stitches can be challenging and daunting. But let me tell you this: embroidery is super easy! Just think of it this way — it’s just coloring with thread! Keep reading as we share 11 types of hand embroidery stitches we can’t live without! The running stitch is mostly used to create an outline to an embroidery design. This kind of stitch used for sewing almost anything from clothing to embroidery. Check this embroidery stitches tutorial here. The back stitch is a thin-line stitch commonly used in outlining a design before filling with satin stitch. It is also used if you want to add fine detail to your work design. Check the tutorial here. The split stitch looks like a mini-chain stitch when done continuously. It’s great to use in outlining designs like floral stems. Learn how to do it here. A stem stitch is beginner-friendly and known to be one of the easiest. Oftenly used in creating an outline of most embroidery stitches, it’s ideal to use for curved or straight lines. Check the tutorial here. It is basically an easy stitch used in covering certain designs (like a leaf) which leaves a smooth, satin-like appearance. Some embroiderers create an outline of the design first using straight stitches to make sure the satin stitches naturally lies within its parameters. Check out the tutorial here. Watch the video below about basic embroidery supplies by Michaels Stores. This stitch is usually used in creating fine details such as the eyes in a design pattern. Although not commonly used, you can use this to fill the center of flowers or round shape designs. See the tutorial here. A stitch that forms a chain-like pattern after a series of looped stitches. This stitch is particularly used for straight or curved lines. Check the tutorial here. This type of stitch is frequently used for making floral and petal designs of most embroidery patterns. It is not made continuously. Rather, you have to make a loop and create a small stitch at the end of the loop, which later on creates a look of a daisy petal. Check the tutorial here. The feather stitch is also known as a single coral stitch. You’ll love it once you’ve learned how to do it because of how attractive and easy to do this stitch is. You’ll love to see the tutorial here. The seed stitch is also considered a running stitch. Some embroiderers also call this a rice grain stitch. It is basically done by making a running stitch in one single direction until it fills the whole design just like the image shown above. Check here for more details. Herringbone is a versatile stitch used to hem garments and is also known as catch stitch or plaited stitch. If you’ll try to create this, you might want to draw parallel lines to make sure you’re getting even spaces in between. See the tutorial here. Watch this video tutorial about creating Embroidery Stitches by Amanda Rolfe. Give yourself a pat on the back for finally learning how to do these hand embroidery stitches. Practice them, and we’re definitely sure you’ll get far! You can create so many hand embroidery designs! If your first several attempts didn’t turn out right, don’t worry! Just keep practicing and sooner or later, you’ll master them all. Happy stitching! Which of these embroidery stitches you love doing the most? Share your thoughts with us in the comments section below. Editor’s Note: This video was originally published in March 2017 and updated for quality and relevancy. I would like to get the floss and free patterns what do I do. Very nicely taught .Would like more tutorials on other advanced stitches. Lovely hand embroidery tutorials… As a child my Gram gave me a piece of blue fabric and a few different colors of floss and a needle to do some freehand embroidery. Having no pattern, I made my own pattern. It turned out very primative in both pattern and stitches. That started me down the path to creating some fun and interesting items. I mostly do x-stitch now. The blue work was thrown out many years ago when Gram past and her handworked pieces were tossed out. Good tutorial, but was surprised by the picture at the top. Hardanger embroidery. Definitely not a basic embroidery stitch.